Disney’s ‘Lion King’ returns to the Los Angeles at the Pantages in Hollywood, circle of life continues in time for the holidays. Individual tickets for THE LION KING may be purchased online at www.HollywoodPantages.com or www.Ticketmaster.com or by phone at 1-800-982-2787. Tickets may also be purchased in person at the Hollywood Pantages Box Office and all Ticketmaster outlets. The Hollywood Pantages is located at 6233 Hollywood Boulevard, just east of Vine Street, and the box office opens daily at 10am except for holidays. Groups of 15 or more may inquire about pricing and availability by visiting www.PantagesGroups.com or calling 1-866-755-3075. Premium Ticket Packages, which include prime seat locations, a commemorative souvenir program and an exclusive merchandise item, are also available. The Holiday Performance Schedule is as follows: November 29 – December 1, 2013: Friday at 2pm & 8pm, Saturday at 2pm & 8pm and Sunday at 1pm. December 23, 2013 – January 5, 2014: Monday & Thursday at 7:30pm,Friday & Saturday at 8pm, Tuesday, Thursday & Saturday at 2pm and Sunday at 1pm & 6:30pm. THE LION KING began as a 1994 animated feature-length film developed and produced by the Walt Disney Company. The story, a coming of age parable set among animals indigenous to its setting, the African savanna, tells the tale of Simba, the lion cub who rises to be the King of the jungle. The role of “Young Simba” is alternated between Jordan A. Hall and Nathaniel Logan McIntyre, and the role of “Young Nala” is alternated between Nya Cymone Carter and Zyasia Jadea Page. The North American touring productions of THE LION KING have been seen by more than 15 million theatergoers and grossed over $1 billion to date. Having already played more than 70 cities across North America, THE LION KING now proudly makes its Los Angeles return at Hollywood Pantages. In its 17th year, THE LION KING remains ascendant; it is the highest-grossing Broadway show in New York history and one of the most popular stage musicals in the world. Since its Broadway premiere on November 13, 1997, 21 global productions have been seen by more than 70 million people and, cumulatively, run a staggering 104 years. Produced by Disney Theatrical Productions (under the direction of Thomas Schumacher), THE LION KING is only the second show in history to generate five productions worldwide running 10 or more years. Translated into eight different languages (Japanese, German, Korean, French, Dutch, Mandarin, Spanish and Portuguese), productions of THE LION KING can currently be seen on Broadway and on tour across North America, in Tokyo and on tour in Japan, in London’s West End and on tour throughout the UK, and in Hamburg, Madrid and Sao Paolo. 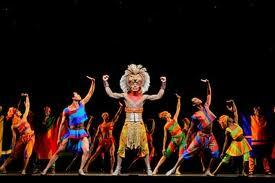 To date, THE LION KING has played 98 cities in 17 countries on every continent except Antarctica. Among the most successful titles in entertainment history, with a cumulative gross in excess of $5 billion, the stage production of THE LION KING has already earned more than the biggest hit films in movie history: more than the Lord of the Rings trilogy combined, more than the six Star Wars films combined, and more than Avatar and Titanic, the two highest-grossing films in movie history, combined. The award-winning musical will celebrate a new milestone in December 2013 when it returns to Australia, making it the tenth concurrent worldwide production ofTHE LION KING, the highest number of productions running at any one time in the show’s history. THE LION KING won six 1998 Tony® Awards: Best Musical, Best Scenic Design (Richard Hudson), Best Costume Design (Julie Taymor), Best Lighting Design (Donald Holder), Best Choreography (Garth Fagan) and Best Direction of a Musical. THE LION KING has also earned more than 70 major arts awards including the 1998 NY Drama Critics Circle Award for Best Musical, the 1999 Grammy® for Best Musical Show Album, the 1999 Evening Standard Award for Theatrical Event of the Year and the 1999 Laurence Olivier Awards for Best Choreography and Best Costume Design. The show’s director, costume designer and mask co-designer Julie Taymor continues to play an integral part in the show’s ongoing success. The first woman to win a Tony® Award for Direction of a Musical, Taymor has in recent years supervised new productions of the show in Las Vegas, Madrid and the UK tour and just completed casting the Brazilian production in Sao Paolo. For more information on THE LION KING, please visit www.LionKing.com. For tickets or more information about the Los Angeles engagement of Disney’s THE LION KING, please visit the Hollywood Pantages’ official website,www.HollywoodPantages.com.